We recently learned that Johnson grass can be toxic in drought conditions. This too, may be contributed to their demise. We’re now making a conscious effort to remove all toxic plants from our pastures before releasing the goats. Contrary to popular belief, goats cannot eat everything and anything. 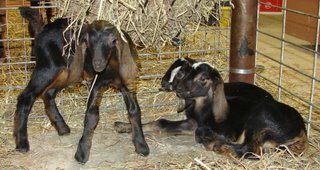 Our goats produce milk that we use every day so their health is our foremost concern. We make sure the best grasses are growing by inspecting our pastures frequently throughout the year. We had almost three months with those two ladies and we were hooked on having dairy goats in our lives forever. Because of the painful yet valuable lessons we learned, we now have a quarantine area in the basement/barn where new goats live until they have ALL their shots, along with boosters, and are examined by our Large Animal Veterinarians. Being new at ranching, we have learned to listen to our long-time rancher friends AND talk to our veterinarians. But most of all, we have learned to listen and observe our animals. We watch them walk. We check their eyes, gums, and manure. We’re with them every day. Then we make decisions based on what is best for that individual animal. We tend to treat our livestock like we treat our dogs. They’re pets. We’ve made the commitment that all of our animals will always be treated with respect and love. After all, they are not only in our lives, they are our livelihood. Getting our first goats was an anxious time, but we were ready. Their shed and fenced area was ready. They had water troughs, feed, and hay. Getting their area ready was work but … we had been living on the ranch for almost a year and only had a few chickens. It was time to get some real livestock. It all began with a sip of milk. Our neighbor had goats and gave us some fresh milk. Never having tasted nectar from the Gods before, I was hooked. Only after being hooked did I become aware of the milk’s nutritional value and health benefits. But the milk was only half the story. Goats are fabulous, intelligent, fun loving creatures! The more we learned about the goats, the more I wanted to know. We read about pasture management, hoof trimming, and nutrition. We subscribed to the Dairy Goat Journal but to actually care for these caprines was a different story. 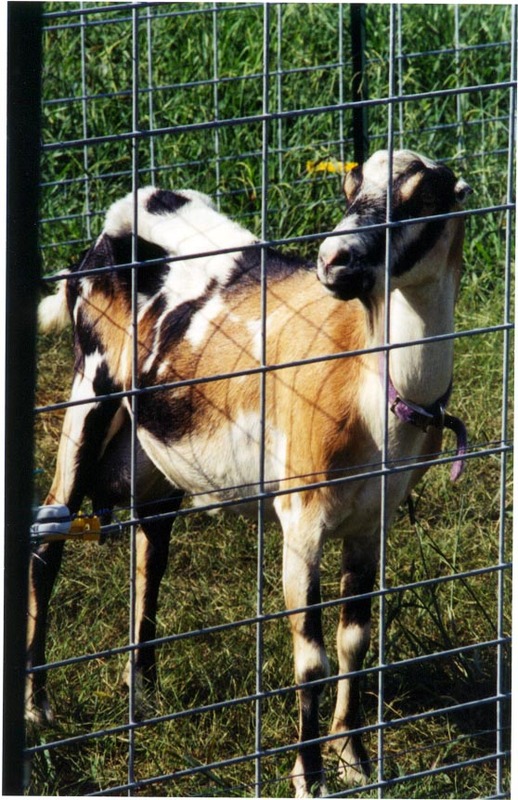 Our first goats arrived on September 14, 2002. Then the lessons began. A LaMancha named “Hazel” and a Nubian named “Delight” became our first teachers. Hazel taught me how to milk her, well, we made a deal, and she taught me just how loving she could be. Her little bitty licks on my cheek were like tender baby kisses. Her gentleness moved me to a different place in animal care. Listening to her belly while milking her reminded me of a rumbling ocean. Ah, the ruminant stomach at work was a marvelous thing. Delight, on the other hand, not only taught me what the word “NO” really meant, she taught me just how high those back feet can kick. Woooowe! We never did milk her but we did learn to move fast and keep our distance. She was fine until I touched her udder, then she morphed into a jumping gehoseaphatt. But, we thought we would work that out. After all, we had trained dogs forever, surely these goats weren’t that much different. HA, was I wrong! But these two ladies taught us much more than we had expected. They taught us the value of vaccinations and the emotional devastation and suffering by not having the proper shots. 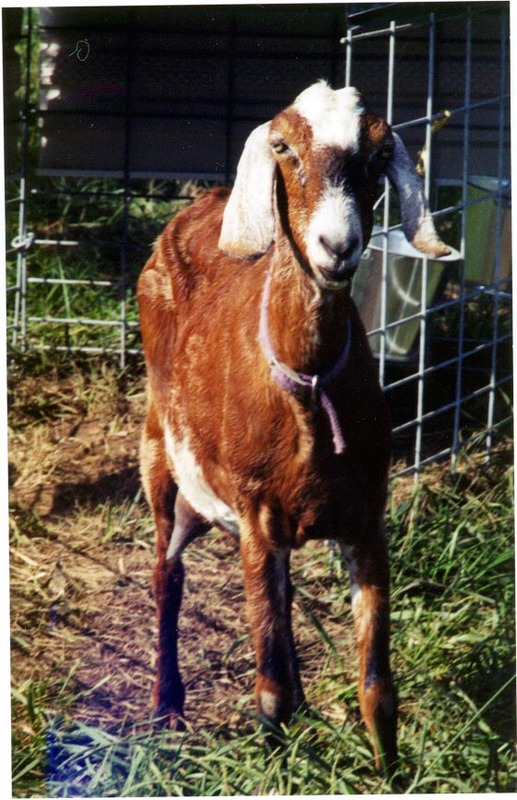 Delight was euthanized on 12/11/02 and Hazel was euthanized on 12/24/02 because both had contracted Tetanus. It was a tough Christmas season. Tetanus is an ugly, painful death that could have been prevented very easily. If only we had known … . But we do know now. We had read about feeding and maintenance but reading about their diseases never entered our minds. What an overwhelming painful price everyone paid. Now we had a new lesson to learn: What do we do with the body? We couldn’t just leave it in the pasture! For Delight, we found a rendering plant that would take her. But when we lost Hazel, we found the county agricultural medical examiner who performed an autopsy. We had to know why these two ladies died on our property and in our care, when they had lived healthy and happily for years just across the tree line without incident. The coroner confirmed that Hazel had died from tetanus. Two $7.00 shots could have prevented this devastation. Lesson learned! This is a photo of this season’s last baby. First-time mama, Reba, delivered a handsome BOY July 12th. Isn’t he adorable!!?!?!!?!?! His name is Ivan, after a Nobel Prize winner in Medicine (why not start BIG), and he is another apple of our eye. Since this photo was taken, ALL the babies have grown and been moved from the basement/barn to the front pasture barn. Running, jumping, eating grass, they’re growing well. Whew! No more babies in the basement/barn. Now THAT’s a treat. We love our babies and will see them through any and all difficulties BUT they ALL belong outside — eating grass! Here’s the gang that I’ve been hanging with lately. Mama Louise had triplets, again. This is the second time she’s had babies AND the second time she’s given us triplets. What a Lady! More on her later. We’ve named them Ross (big white spot on top of head), Emil (long beige stripe on face), and Pearl (standing). Did I mention that Pearl is the ONLY girl this year? Whew! We had nine babies: eight boys and one girl. Do I need to tell you that she gets just a little bit of extra care?! Didn’t think so. But not really, all our babies are treated with tender care. This set was born July 7, 2006 around 4 in the afternoon. I was with Louise for the first two babies, the boys. After waiting for about 45 minutes, I went upstairs to let the new family get acquainted. When I came down about an hour later, there lay our little jewel — the ONLY girl. Our little black Pearl. 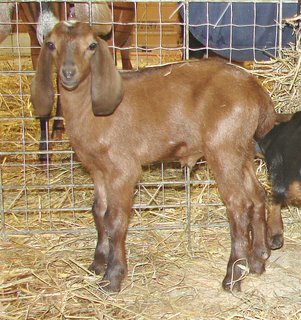 We name all our registered Nubians after country western singers. Our little black Pearl fit right in with another doe named Minnie. Now we have the classic entertainer Minnie Pearl respectfully commemorated. From time to time, I’ll post a few pictures as a way of introducing our goats. Hey, I think they’re wonderful and delightful to work with. I believe our photographs will help show their incredible personalities.